What is Art? What does it mean to you? It can mean many things. I believe you can capture its essence with three words, communication, inspiration and emotion. It is an expression or application of a human creative skill with imagination. It can redefine the world, as we know it. This is a tremendous topic to tackle so without getting too philosophical. Art is anything someone wants to call Art and it is beyond the realm of rational thinking. There are no rules and it does not need to make sense. I’m going to approach this subject from a few angles while hoping to inspire and enlighten you. Since I come mostly from the commercial world, I’m going to draw information from advertising to demonstrate my definition of what Art is. Communication takes on many forms especially when it comes to advertising. The historic 1960 “Lemon” ad campaign is a great example of how the right design can be a force. The Volkswagen Beetle was known as Hitler’s favorite car. Only 15 years after WWII, this ad revolutionized advertising forever. 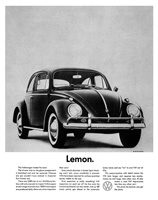 The advertising agency Doyle Dane Bernbach (DDB), introduced the Beetle to America with a simple black & white photo with the words in bold “Lemon”. What follows is a statement below the image that proclaims that this particular car missed the boat and was rejected by Inspector Kurt Kroner, because of a blemish you would not have noticed on the chrome piece of the glove box. The ad goes on to describe the rigorous inspection process; one out of fifty does not pass for something as simple as a surface scratch barely visible on the windshield. “This preoccupation with detail means VW lasts longer and requires less maintenance, by and large, than other cars.” Concluding with a memorable tag line “We pluck the lemons; you get the plums”. The first impression is that Volkswagen is calling their car a lemon. How could a car company call their product a lemon? This question is intriguing enough to read further only to see that this ad is really about the rigorous inspection process that Volkswagens go through. AMC’s popular TV show “MAD MEN” referenced how ridiculous this ad might seem but they correctly pointed out that it made you engage in conversation. In that sense, it did its job to get you to simply talk about it. The honesty of the campaign was a constructive force and a critique of society. It took on all the other car manufactures who where building large vehicles with many accessories and flashy colorful ads. While VW comes up with this minimalist approach from every aspect and essentially communicates its message with one word. It broke the rules of advertising and launched a new idea. William Bernbach of DDB is considered the father of the “Creative Revolution.” This movement formed the creative ad agency that still lives day. The Lemon ad surely inspired its audience. Another example of an inspiration is a poem I have selected to illustrate how it inspired/influenced and set off a chain reaction that formed the modern image of Santa Claus. “A Visit from St. Nicholas“, also known as “The Night Before Christmas” and “‘Twas the Night Before Christmas”, is a poem first published anonymously in 1823 and generally attributed to Clement Clarke Moore. It is believed that a friend sent a copy of the poem to the New York Sentinel who published it. Moore wanted to be known as a scholar and only wrote the poem for his children. 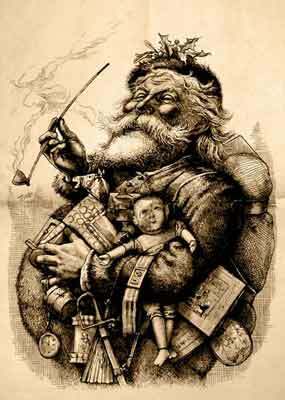 Incidentally, Moore’s conception of Santa was borrowed by his friend Washington Irving. In the 1920’s people thought of Coca-Cola as a drink only for warm weather. The Coca-Cola Company began a campaign to remind people that Coca-Cola was a great choice in any month. This began with the 1922 slogan “Thirst Knows No Season,” and continued with a campaign connecting Santa Claus with the beverage. 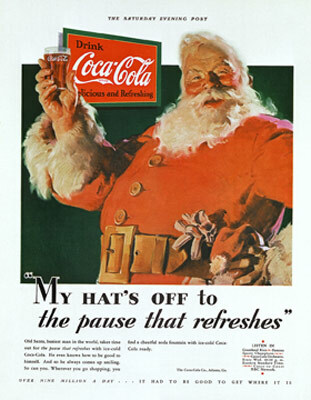 Coca-Cola’s advertisements of Santa Claus by artist Haddon Sundblom in the 1930’s are generally recognized for creating the modern image of Santa Claus. According to Coca-Cola, Haddon was inspired by Moore’s poem as a basis for the image. Over the years, these images were so popular that if anything changed the Coca-Cola Company would receive questioning letters. The Letters, for example, would ask why Santa is not wearing a wedding ring and what happened to Mrs. Claus? I think these images were so popular because Coke’s campaigns received so much exposure in part because they were beautiful and were consistently done from 1931-1964. It is this constancy/branding that reinforced Santa Claus’s image and set it apart from anything else. The emotion that these images engendered in the mind of the audience was very powerful. The images communicated the magical feeling and spirit of Christmas. 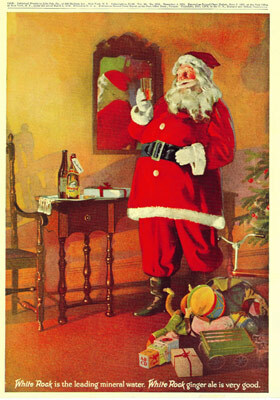 Another beverage company used Santa Claus for their advertisements and did it years before Coco-Cola. In a 1915 their first ad was published in the San Francisco Examiner. White Rock Beverages could be considered the creator of the modern day image of Santa Claus but they did not repeat or expose their ads to the extent Coco-Cola did. The emotion was not engendered so they are unfortunately forgotten. The ad featured here is from 1924. Good old Saint Nicholas can be traced back hundreds of years and all along the way, writers, musicians, painters, etc. have been influenced and inspired by one another. These inspirations continue to evolve and define our perceptions everyday. Santa Claus’s image without a doubt brings on a nostalgic emotion but many artists express their emotions through their art and the finished art will reflect that emotion. My work tends to follow this format. Other artists may make an image with the hope of creating an emotional response. Instead of illustrating the obvious by using a famous work of art as an example I am going to use my work to illustrate this point and have my readers prove my point by submitting their thoughts in a contest called “The Rules of Art”. “The Rules of Art” contest encourages fans to choose an image from the www.scottsilver.net website and explain in two or more sentences what that image means to them and what emotions they feel. In the spirit of “what Art is,” I am looking for creative responses that provoke communication, emotion, and inspiration. Maybe you go the extra mile and write a short story? I can only dream. All fans are invited to participate in “The Rules of Art” contest. Contest begins January 1, 2012 and ends May 1, 2012. Information on how to enter and prizes form part of these official rules (“Official Rules”). By submitting an entry, each entrant agrees to the Official Rules and warrants that his or her entry complies with all requirements set out in the Official Rules. Any Scott Silver Facebook Fan or Blog Subscriber. Simply comment on a photo. Please state the photo your responding to and preferably attach photograph to your comment. Having trouble getting the image? Go to my Flickr account and right click on an image and copy it to your desktop then upload to Facebook. Contact me if you have any problems. – Total number of comments from your Facebook or blog post. Meaning I will count the comments for each post. The person with the most communications will win the communications category. – Since Art is subjective so will be your responses and I will decide who’s submission is the best. Decision of the judging is final and binding. Have fun and enjoy the process. Lets engage in conversation!!!! Since I just published my fan page and blog I need word to spread and that takes a little time. April 1st I will select a winner. Help me spread the word!! The winner will receive a signed $300 value museum quality 6×9 archival pigment print. It’s guaranteed to last 100 years. Prints are matted on 16×20 acid free matt board. If you have any questions please contact me. This is supposed to be fun and create open dialogue. Happy to be the first to comment on your blog. I enjoyed it very much and look forward to seeing your next article and contest submissions. I found you’re blog via searching the net and I have to say. A Massive Thank you so much, I believed that your article was very educational I’ll revisit to see what extra great information I can recieve here. I’d have to verify with you here. Which is not one thing I often do! I enjoy reading a post that may make people think. Also, thanks for allowing me to remark! Did you have anything in mind? Sorry for late response but I receive so much spam that I find it difficult to determine real people. The spammers are so good now. I must say that your blog post was quite useful. It is good to see high quality information being wrote on the internet nowadays. I personally own and run a site and I recognize the high priority of quality content and it’s vast impact it makes on the quality of a site. I personally believe kudos should be handed out when its deserved to other webmasters. Simply desire to say your article is as astounding. The clarity in your post is simply spectacular and i could assume you are an expert on this subject. Fine with your permission let me to grab your RSS feed to keep updated with forthcoming post. Thanks a million and please carry on the rewarding work. Thank you so much for your kind words. I would be happy for you to subscribe and get my RSS feed. Let me know if you have any problems. I use WordPress and do not have any issues with it other then the occasional software conflict. There are so many plugins for WordPress that sometimes you need to make sure there are no conflicts. I recommend WordPress and I hear a lot of good things about blogger. You ought to be a part of a contest for one of the highest quality websites on the web. I’m going to highly recommend this web site!